Selfie, a term which is now used by everyone and everybody loves taking selfies on every single occasion or just may be sometimes, people click some casual selfies. Let it be a house party or a festival or an event, selfies are now ruling the social media and now, people are conscious about the front camera, as much as they care about the quality of the rear camera so most of the manufacturers are concentration on the selfie camera as well, and putting them in their handsets. Today, we will talk about two of them, HTC Desire Eye, which was launched in October 2014 and Micromax Canvas Selfie, which was launched in December 2014. We will discuss about the specs, camera quality and price of both the phones and will compare them. So, let’s start the HTC Desire Eye vs Micromax Canvas Selfi battle, but before that let’s take a look t the key specs of both the phones. This phone from HTC was launched in October 2014, and may be it was one of the first phones to have a very powerful front facing camera. Though in India, it was launched after a little delay, but HTC Desire Eye was much hyped on the web and it has been a pretty good choice for selfie enthusiasts. 5.2 inch capacitive touch screen with resolution of 1080×1920 pixels. Powered by 2.4 GHz Qualcomm Snapdragon 801. 2 GB of RAM and 16 GB of internal storage which can be expanded up-to 128 GB via microSD. Camera: 13 MP of front and rear with dual flash. Connectivity features: Wi-Fi 802.11 b/g/n. GPS, Bluetooth v 4.00, micro USB, 3G. Single regular GSM SIM. 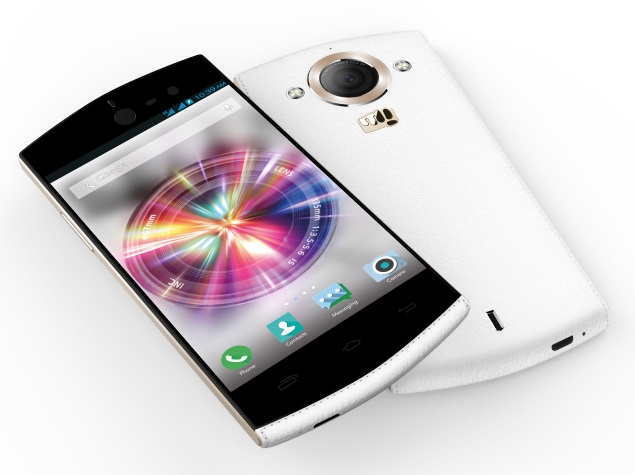 Micromax, the Indian smartphone manufacturer launched Canvas Selfie last year in December. In case of camera, it is similar to HTC Desire Eye in case of resolution, but the phone was prices much lower, just the half of HTC Desire Eye. But, it differs a lot in terms of hardware and specs. 4.7 inch capacitive touch screen display with resolution of 720×1280 pixels. Internal storage of 16 GB with expandable up-to 32 GB via micro SD card. Flash LED for both front and rear camera. 13 MP front and rear camera. Dual micro-SIM (GSM+GSM) with 3G connectivity for SIM 1. Colors: Mystic blue and Angelic white. So, both the phones are same in terms of camera resolution, but they differ in various aspects including the specs and price, in fact the price margin differs a lot between the phones. 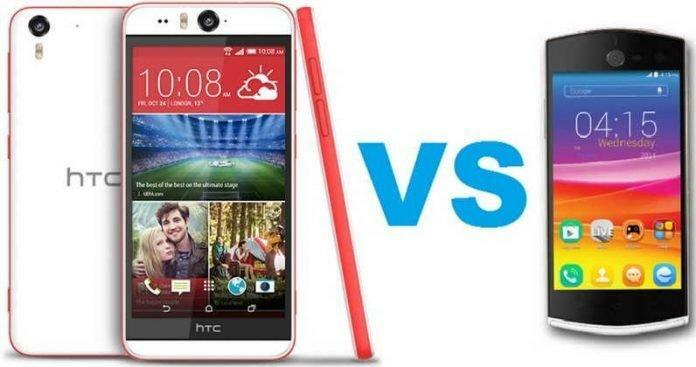 We will separately describe taking every factor into account and compare HTC Desire Eye vs Micromax Canvas Selfie. Canvas Selfie has a 4.7” HD IPS Display delivering screen resolution of 1280X720 pixels with protection against the scratches, as it comes with corning Gorilla Glass 3. On the other hand HTC Desire Eye has a bigger capacitive display measuring 5.2”, which offers screen resolution of 1080X1920 pixels. HTC Desire Eye has 11% bigger screen than Micromax Canvas Selfie and 1.25 times higher resolution. The battle between HTC Desire Eye and Micromax Canvas Selfie mainly narrows own to one key feature- camera. HTC Desire Eye and Micromax Canvas Selfie both have got 13 MP sensors on borad, for both rear and front camera. HTC Desire Eye has a 13 MP Sony BSI Sensor with f/2.0 and has a resolution of 4208×3120 pixels, other features include Auto-focus, Geo-tagging, Touch focus, Face detection, Panorama, HDR, etc. Along with this video recording 1080p@30 fps, Micromax Canvas Selfie has also got 13 MP front and rear snappers, but it has got some cool features and enhancements like smoothening skin, skin whitening, oil removal, face slimming, eye enhancement, teeth whitening etc. which we usually will not get in any other handset. HTC Desire Eye is powered by Qualcomm Snapdragon 801 chipset and Quad-core 2.3 GHz Krait 400 processor along with Adreno 330 GPU, whereas Canvas Selfie is powered by 1.7GHz Tru Octa core processor which is based on MTK 6592 chipset. In terms of processor cores, Micromax Canvas Nitro has twice the number of cores than HTC Desire Eye has, but at the same time HTC Desire Eye has higher clock speed at 2.3 GHz, so basically HTC Desire Eye is around 35% faster than Micromax Canvas Nitro. In Case of RAM, bot of them have 2 GB of RAM, which should be ample for smooth operation. Both the phone run Android 4.4 Kitkat out of the box, but there is no confirmed date about the Lollipop upgrade for these phones. In case of storage, Micromax selfie has 16GB of memory on board out of which 12.14GB is available and the external memory is expandable up to 32GB. HTC Desire Eye also has 16GB of internal memory, but it can be expanded up to 128GB. Both the phone have the required connectivity options like Wi-Fi, Bluetooth, GPS etc. but HTC Desire Eye has 4G connectivity which makes the phone future proof, where has Micromax Canvas Selfies has got only 3G, but it has dual SIM card slots, among them one can be used for 3G and another for 2G. In case of battery, HTC Desire Eye packs a 2400 mAh battery, whereas Micromax Canvas Selfies has a little less powered battery at 2300 mAh, so basically HTC Desire Eye lasts 4% more powerful battery. 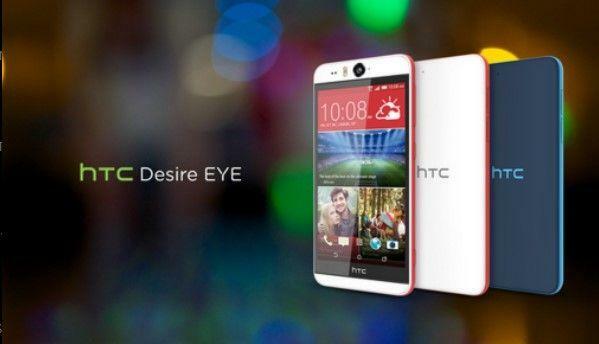 HTC Desire Eye costs around Rs. 35,000 (approx.) whereas Micromax Canvas Selfie is more than 50% cheaper, pricing at just around Rs. 15,000 in India. Both the phone are excellent for taking selfies, but as usual, Micromax could not get rid of their old problem which is the flash. From my experience with the phones, I can say that HTC Desire Eye packs a much better low light photography and Micromax Canvas Selfie is not that bad, but if you need an excellent phone for selfies, go for HTC Desire Eye. But, at the same time you should keep in mind the pricing for both the phones, as HTC Desire Eye costs more than twice the prices of Micromax Canvas Selfie. If you are a selfie freak, and willing to get the best, go for HTC Desire Eye, or else if you have a tight budget, Micromax Canvas Selfie is there for rescue. So, this was our take on HTC Desire Eye vs Micromax Canvas Selfie. Which one do you prefer? And if you have any doubts regarding the phone, we are here to help you choose, let us know about your doubts, queries or suggestions in the comments section below. Next articleHow To Upgrade from KitKat to Lollipop on Micromax Canvas Nitro A310?